Every business leader I know is looking for the same thing: An edge. They all want that elusive something that will get their team and their organization ahead of — or keep them ahead of — their competition. And one place many look for it is by investing in the wisdom of an outsider — the professional business speaker. Yeah, that’s me. But I’m one of many, some good and some, well … caveat emptor, as the Romans used to say. The fact is, not all business speakers provide that edge, and leaders can ill afford to waste time and money on those who don’t. If you’re just looking for some inspiration, that’s one thing. But most leaders want more bang for their buck. They want a return that doesn’t fade when the rah-rah rock star is gone and everyone is back with the grindstones pressed against their noses. They want a speaker who provides knowledge, tools, and techniques that actually improve the quality and success of the business. They want someone who gives them an advantage in things like leadership, strategy, customer service, and technology. They want someone with no fewer than these 13 qualities. Speakers who have never left the ivory towers of the world can offer some great theories, many of which actually work. Speakers who have lived and led in the trenches can relate those theories to the topic at hand and the experiences you and your team face. 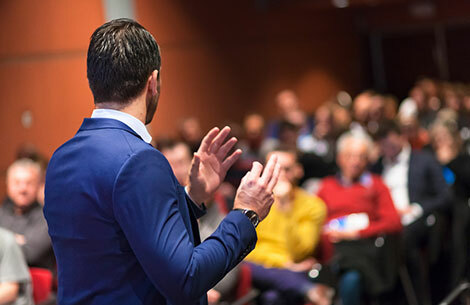 The top business speakers can offer an impressive list of clients who willingly and enthusiastically vouch for their effectiveness from the stage. If a speaker has no raving fans, don’t bet the farm (or the widget factory or the sales team) that you will become the first. A friend of mine puts it this way: “Tell me something I don’t know and tell me something I can’t get anywhere else.” Yes, but there’s nothing new under the sun, you might say. True, but effective speakers don’t provide the same old take on the same old, same old. They bring a distinctly different message and/or delivery. They have a provocative message and a unique point of view. They have fresh ways to bring timeless truths to new circumstances and new market conditions. High-flying philosophy is fine, as long as it’s translated into something valuable and practical you can use today. Great content might as well be awful content if no one absorbs it. And if your audience can’t relate to the speaker’s style or content, then your audience won’t absorb the speaker’s message. Yes, this is a purely subjective assessment, but no one knows your audience better than you. So go with your gut and choose someone whose personality you think your group will enjoy. Most speakers with valuable content are given an hour or less for their initial presentations. That’s enough time to teach some important lessons, but the best content inevitably requires resources that help you and your team go deeper. A presenter puts on a great show from the stage, while a facilitator draws the audience into the conversation and promotes discussion. It’s hard to find both qualities in the same person, but it’s worth it when you do. The most effective speakers have published books and/or articles on their topics, which gives them credibility with your audience and provides a resource you can read to study and reinforce their ideas. Sir Francis Bacon once said, “Reading maketh a full man; conference a ready man; and writing an exact man.” Speakers who have refined their message into written forms tend to have the excellence that comes with precision. No audience wants to sit through a dry and academic presentation. Even very serious topics require a little relief. The best speakers don’t have to be the next Steve Martin, but they need the ability to lighten the mood and make people smile and laugh. You want a speaker who has wide exposure to a variety of industries and audiences. Even if you’re looking for someone who is very specialized in your specific line of work, the broader the industry experience, the more ideas they’ll have on how to apply their knowledge to your business. Beware the speaker who works from a script and quakes at the thought of questions from the audience. Even if you choose not to have a Q&A session, you’ll want a speaker who welcomes it. Unsolicited solicitations from the stage can confuse the audience and dilute the message. Is the speaker here to share a message or sell products? There might be value (to your team and the speaker) in allowing a sales pitch, but be clear about those expectations on the front end and don’t permit speakers to sell from the stage unless you have an agreement that allows for it. Finding a business speaker for your organization is easy. Finding one with all 13 of these qualities takes a little time and research, but the payoff comes in gaining the edge you need to grow your team and build your business.